We have been serving the greater Houston area including Katy, The Woodlands, Cypress, Spring, and Tomball since 1990. Our company is family owned and operated with some of the best technicians in Houston, Texas. Our company is family owned and operated with some of the best technicians in Houston, Texas. We are licensed and insured. We are one of the few companies that operate 24/7, and our phone is always answered by a live person. We do not charge for after hour or weekend service calls. We strive every day to become the best HVAC company in Houston. With over 50 years of experience in the industry, we know what it takes to make you comfortable in your home. At Houston Admiral, our slogan is “We Spoil You with Service.” We have lived up to that since day one. We offer many air conditioning solutions, such as Air Conditioner and Heater Maintenance, Heating and Cooling Service, A/C Repairs, Heater Repairs, Air Conditioner and Heater Replacement, Air Purification, and Air Balancing. We know when you air conditioner is down, you need it fixed right now! That’s why we offer Same-Day installs. Call Houston Admiral today to schedule an appointment! Houston Admiral is 100% committed to your 10 year parts and labor warranty. 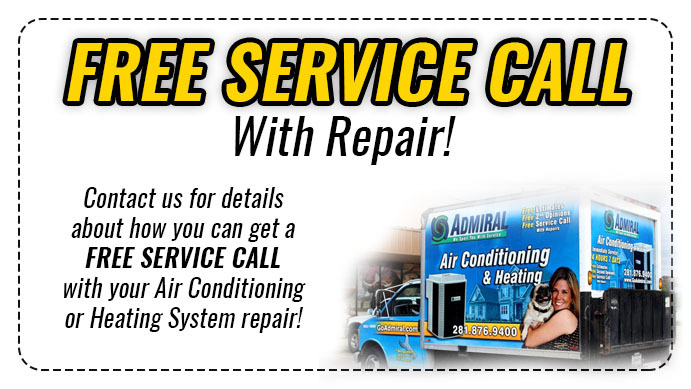 Houston Admiral is proud to be staffed with the best air conditioning service in Houston! We don’t add extra charges or hidden fees for work done after working hours or on weekends. My wife and I moved to The Woodlands in the spring of 2011 and immediately experienced a/c problems during one of the hottest summers on record. After trying our home warranty company several times and being disappointed we called Houston Admiral on the recommendation of someone we trusted. They responded immediately, fixed the problem and we’ve been using them ever since for our heating and cooling needs. They have always been prompt, professional, done a good job and stand behind their work. Highly recommended. 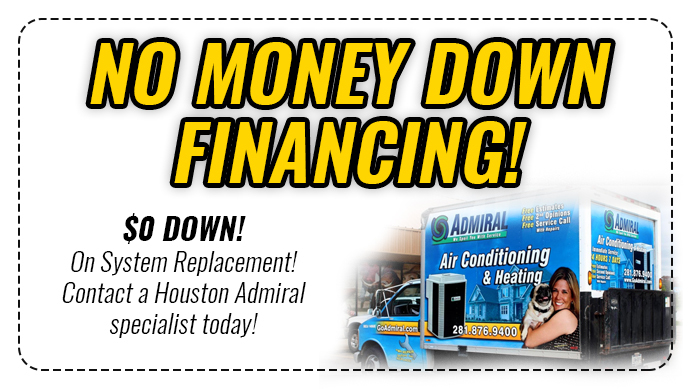 Houston Admiral Air Conditioning and Heating is fast, dependable and convenient service to all local homeowners and businesses. No overtime rates after 8am to 5pm from Monday through Friday and no overtime rates for emergency service, including Sundays. [sdf_collapse title=”Why Your Air Conditioner Freezes Up?” state=”active”]By “airflow” we mean the amount of air flowing over the air conditioner evaporator coil. When airflow is restricted or reduced, there’s less heat for the evaporator coil to absorb, causing the temperature to drop to freezing levels. Air conditioning systems operate at an evaporator temperature of 40-45 degrees. When air flow is diminished the coil temperature drops close to 32 degrees, this causes the evaporator coil to freeze. Then, when humid air comes into contact with the coil, moisture condenses on …..
[sdf_collapse title=”How Heating and Cooling Systems Work?”] All climate-control devices or systems have three basic components: a source of warmed or cooled air, a means of distributing the air to the rooms being heated or cooled, and a control used to regulate the system (e.g., thermostat). The sources of warm air, such as a furnace, and cool air, such as an air conditioner, in a house often use the same distribution and control systems. If your house has central air conditioning, cool air probably flows through the same ducts that heat does and is regulated by the same thermostat…..
[sdf_collapse title=”Which Central Air Conditioning System is the Best?”]The basic run down of how the AC unit work is that the air blows across the evaporator coil where refrigerant turns into a gas from a liquid by absorbing the heat from the air as well as the moisture. From there it flows into the condenser and compressor in the outdoor unit where it releases the heat and turns back into a gas. Then the air that is now heat free is now cool and is pushed back into the house and spread through the air duct system distributing the now cool air throughout the house, cooling the …. [sdf_collapse title=”How Heat Pumps Work?”]Heat pumps are used for either the heating or cooling of your home by transferring heat between the indoors and the outdoors. Because heat pump systems transfer heat rather than generating it, they are more energy efficient. In the warmer months, the heat pump acts like an air conditioner, removing heat from the air inside your home and transferring it outside During colder months, the opposite is true, as the heat from outdoor air is extracted and transferred to the interior of your home. Believe it or not, even …. WHAT IT IS? The most common central cooling system is a split system, which includes an outdoor cabinet containing a condenser coil and compressor, and an indoor evaporator coil, usually installed in conjunction with your furnace or air handler. The compressor pumps a chemical called refrigerant through the system. HOW IT WORKS? The warm air inside your home blows across the indoor evaporator coil and the heat energy from the air transfers to the refrigerant inside the coil. Think of the refrigerant ….